Running a marathon is difficult enough as it is, but doing so as a blind person, less than five months after taking up the sport, is an extraordinary task. But as the days count down to the 2018 BLOM Bank Beirut Marathon on November 11, that’s exactly what Ghina Achkar, a 26-year-old Lebanese woman, is preparing to do. Achkar turned blind during high school but when she takes to the line next month, her sight will be the least of her worries, given she only took up running in recent months and now has to cover 42.2km on foot. “The furthest I’d ever run before I woke up in June and decided to run this year’s marathon was to catch a bus,” says Achkar, who will race this year’s marathon as part of Team Blind With Vision, a new initiative which brings together blind and partially sighted runners to race the BLOM Bank Beirut Marathon. Since late June she has been running three times a week with Team Blind With Vision, led by group’s coach Mary Kleyani. 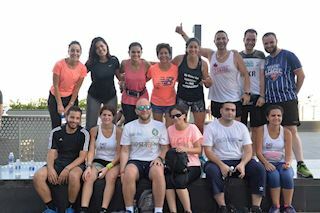 With support from the 542 community – a running program operated by the Beirut Marathon Association which helps newcomers complete their first marathon – Achkar has progressed rapidly in recent months and is thankful to her guides for the help on this journey. Achkar, however, admits all of this was never in her plans until recently. She will race not only for herself, but to prove to people with visual impairment everywhere that they don’t need to limit their aspirations – in sport and in life. Marathon running may be known as an individual pursuit, but for Team Blind With Vision it’s been anything but. When they take to the streets of Beirut next month, they will do so as a group, working together to achieve a common dream.